Cairo routes company calls based on multiple criteria such as route calls to specific internal contacts, apply group rules, company generic rule, distribute calls using virtual ACDs based on users skills and callers preferences, .... In addition in case of emergencies, all calls can be automatically routed to the employees mobile phones. Cairo improves companies' productivity by providing a comprehensive control tool allowing production managers to gain insight into improved operating efficiencies. Cairo's operations are based on working time, activities and company business processes. Call routing based on specific internal events. Business Continuity Telephony Processes in case of Disaster Recovery Plans. Cairo improves company call distribution rules while identifying the caller. 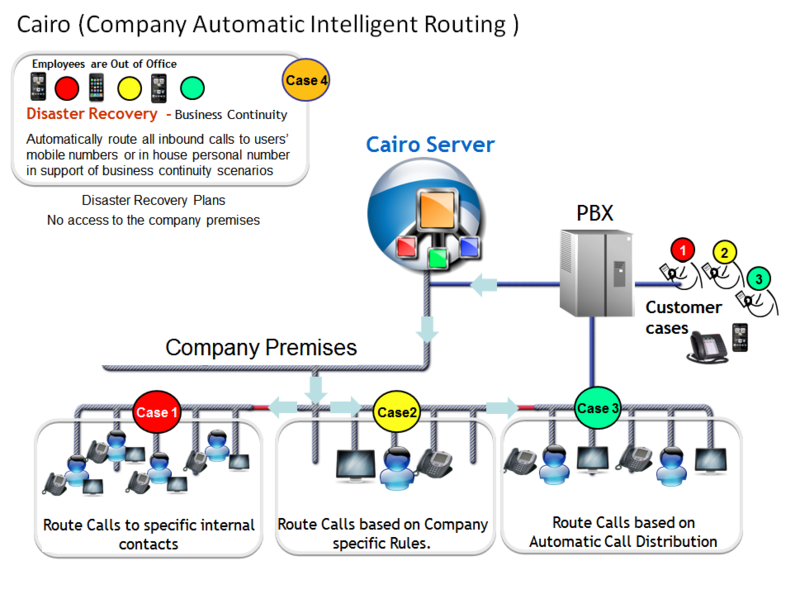 Cairo extends the business benefits of Integrated Communications and Communications Enabled Business Processes (CEBP) to contact centers and other volume call-handling businesses.